The co-writer of The Dark Knight has been officially confirmed as a scribe for the next Superman movie. It looks like Warner really wants to make its next Superman movie a success on par with The Dark Knight, and is using top talent from the Batman reboot to do so. After bringing on Dark Knight director Christoper Nolan as a guiding light, Warner Bros. has now also hired David S. Goyer, co-writer on The Dark Knight, to pen Superman's next theatrical tale. The movie's current title is planned to be The Man of Steel. It won't be an origin story, which is a good thing, because everybody across all dimensions, even those without Superman in them, already knows the origin of the world's greatest hero. 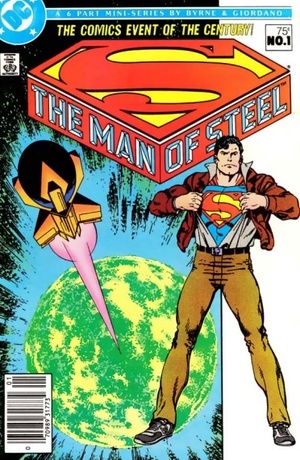 Thomas Tull, head of Legendary Pictures, allegedly went straight to Goyer, who pitched a storyline that would bring Superman back to when John Byrne revamped him in 1986 with The Man of Steel comic miniseries. Goyer's modern sort of narrative, where The Daily Planet is struggling due to the internet, includes major villains Lex Luthor and Brainiac doing something evil-ish in Metropolis. It also supposedly sets up a "huge Kryptonian mythology." Superman Returns star Brandon Routh will not... return, nor is the film's director Bryan Singer likely to work on The Man of Steel. And no, Nicolas Cage isn't going to star in it either.